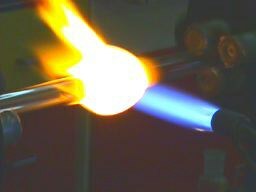 This page deals a little with glass blowing in general and presents a brief description of how one of the many types of Rife plasma tubes that we make is fabricated. 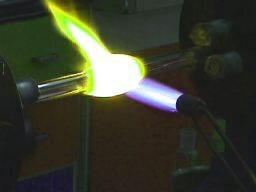 In this case we will show the process of how a bubble tube is formed. Our tubes are used in a wide variety of Rife machines like the Rife Bare device and the EMEM 2 and 3 systems. Our most popular tube, the Phanotron (Phanatron) is fabricated in much the same way. And of course we also fabricate plasma tubes that are used in a wide variety of other devices and systems. 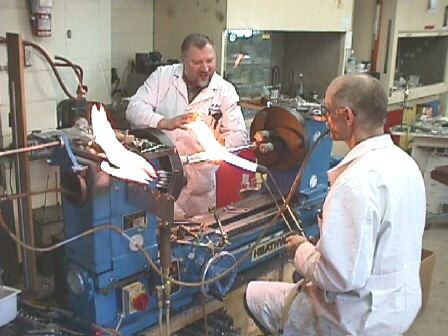 Scientific glass blowing is a combination of technical knowledge and artistic talent and skills. It seems that most glass blowers of this caliber are European trained, with teaching and apprenticeship going on for several years. The equipment required to do this work is extensive and expensive. 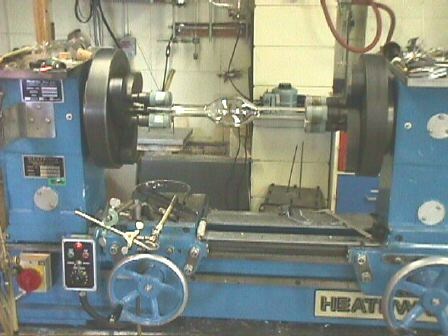 A typical glass blowing lathe, for example, can cost upwards of $40,000. The range of oxy-gas torches used in the formation of glass objects can be upwards of a dozen different types, as well as other "tools" of the trade including high temperature ovens, sand blasting equipment, vacuum pumps and so on. You will see some of these items in the pictures following. We first see here a length of 32 mm Pyrex glass tubing which is the basis of our bubble tube, mounted in a glass blowers lathe. 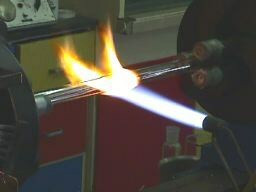 As the center of the tube is heated and becomes soft, the ends of the tube are slowly brought closer together while the glass blower carefully applies positive air pressure to the inside of the tube. This causes a bubble to start to form in the central heated area. As the bubble continues to form, more heat is applied to maintain the process. The process is now well underway. It is here where the glass blower's extensive skills come into full play. The bubble must be formed in a way such that the glass wall thickness of the bubble is the same as that as the rest of the tube. This insures that the mechanical strength of the completed tube is the same throughout and that the bubble is not a weak spot. Below, we see one of the ends of the tube being finished off. Here is the completed bubble tube still mounted in the lathe. After the tube cools enough to handle, it is placed in a kiln for several hours at a temperature of 550 degrees C. This is to anneal (stress relieve) the glass. As well, any carbon based contaminants are burned away. The final step is then to put the tube on a vacuum pump for several more hours to bring the interior to a near absolute vacuum. 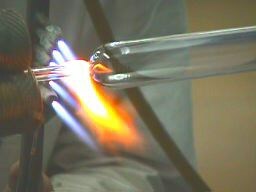 At this point, the tube is carefully filled with the required gas to the desired pressure, which is usually in the 6 to 10 mm of mercury range. Many don't realize that this "pressure" range is in reality, still at a near vacuum. Finally, we have this same tube, filled with an Argon gas mixture and energized with a Rife/Bare experimental frequency device. Any one wishing to inquire about my plasma tubes or pose questions, can click HERE for contact information. To see a full range of plasma tubes available for sale, please see my Tube Gallery Page.